IAG, the parent company of British Airways and Iberia, announced last week that it has applied for permission to operate price fixing with LATAM (owner of LAN and TAM) on flights between Europe and South America. They don’t call it price fixing, of course. It is a ‘joint business agreement’, similar to the one which BA, Iberia, Finnair and American Airlines have for flights to North America. BA has a similar deal with JAL for flights to Japan. The four airlines (BA, Iberia, LAN, TAM) will pool their transatlantic services into one special purpose entity. All flights will carry a flight code from each airline. Fares will be harmonised. Schedules will be adjusted so that flights do not compete directly against each other. Frequent flyer benefits will be also be aligned. This means that the earning rate in terms of Avios and tier points will be identical whichever airline you fly, which will be an improvement. The deal will require regulatory approval which will take 12-18 months, although there is no obvious reason – given precedent – why it should be refused. The only issue is the potential lack of competition compared to, say, UK to North America routes. Wyndham is the biggest hotel group in the world. It has achieved that despite having only a paltry UK presence which consists of a handful of Ramada and Days Inn properties. It is about to have an even smaller presence. Two of the most high profile Ramada properties – Birmingham City (picture above) and Manchester Salford Quays – are jumping ship to Marriott and have already been removed from the Ramada website. Once refurbished, they will become the first UK hotels to be operated under the ‘AC Hotels by Marriott’ brand. AC Hotels is a Spanish group which Marriott acquired a few years ago. I would love to tell you what is special about it compared to the many other Marriott brands but I honestly have no idea. It is apparently a ‘design led, lifestyle brand’. I was quite taken by the canal-side rooms of the Birmingham hotel in The Mailbox although the only reason I stayed there was because bmi British Midland was offering 5,000 miles for a single Wyndham stay in a promotion once upon a time! Bits: Emirates to fly Larnaca-Athens, Lufty boosts short-haul business legroom - will BA follow? The last eighteen months haven’t been too good for Wyndham in the UK. On top of those two London West, Docklands and the the Encores at Crewe, Barnsley and Haydock have also been reflagged. Glasgow airport was sold recently as well, I wouldn’t be surprised if it were to go as well. This latest price fixing deal needs to be opposed. The current ones simply mean UK consumers are paying substantially more for flights than near continent citizens and BA are now one if the most protected airlines in Europe with total dominance at LHR and a monopoly on domestic services. It’s shocking that I need to go to DUB, OSL or a myriad of other EU cities to get a good deal on flights, often returning to LHR to sit on the same plane And same seat, at fares which are often half the fare ( or less)I can buy by flying direct. This is even before we discuss the scandal of redemption fees BA charge on for flights on carriers with no such charges. The price-fixing helps BA’s profitability in its core market UK, where it has a stranglehold on LHR slots. This frees up BA to offer enticing prices in secondary & tertiary mkts ie EU. Let FTSE 350 pay top dollar, let independent travellers savvy enough to seek out cheaper prices benefit. Agreed, he obviously doesn’t know how the airline industry works, and that’s not just BA. Nor how the car industry used to work. For years the UK market was known as “Treasure Island” for the car industry. We used to pay so much more for our cars here. I’m guessing the fact that the UK is most of the cars that need right hand drive in Europe rather than left hand drive was claimed to be of an exorbitatant extra cost by the car industry infrastructure. Somehow despite this we now have mostly very competitive car prices within Europe. It was dismantled for the car industry. So it might be dismanted for the aviation industry. Like Harry this would disappoint me greatly as arbitrage opportunities for those prepared to make some sacrifices would be lost. Lastly, if this price fixing agreement goes through, as TAM is a Star Alliance airline whereas the other ‘partners’ are Oneworld I can see a lot of people finding out after their flight they haven’t earned any award miles at all if they are on a codeshare flight operated by a nonearning combination of operating and marketing airline. Yes, either LAN or TAM had to switch due to the merger and it was TAM who had to jump. That doesn’t answer the question. How does that have anything to do with price fixing? Why do you think it took a decade for the BA / AA JBA to be agreed? Remember the Virgin ‘No Way BA / AA’ campaign? It is price fixing dressed up. If Asda and Tesco sign a document agreeing to co-ordinate where they open stores, to close stores in towns where they compete, to charge the same prices as each other and to share their profits at the end of the year, I doubt it would go down well. This is exactly what is happening here. All of the non-price fixing bits are simply window dressing to confuse the issue. What on Earth are you two talking about!? I’m well aware what price fixing means. The claim was made that price fixing is responsible for prices being lower from Dublin and Amsterdam than London – explain please. I stayed at the encore Doncaster airport recently and it was quite poor. I also wasn’t impressed at the blurb about wyndham rewards to be honest. 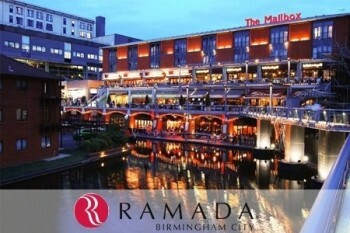 The Ramada hotel at the Mailbox in Birmingham was originally a Days Inn before moving to Ramada and now Marriott. The hotel is completely closed as is the whole of the ‘shop front’ area which featured a Starbucks so certainly no transition period to the new brand. The Ramada Salford Quays shares the same location of an Ibis Budget, the buildings share a wall. I wonder if this will disappear too, can’t imagine Marriott will be too happy with it being next door. I signed up for Wyndham Rewards simply because I had a stay at the Excelsior hotel in Berlin. Two nights at about 60 odd euros per night, including breakfast. Never stayed again, but when it was time for my points to expire, I looked at the redemption options and was able to get an M&S voucher – i think it was either 10 or 15 pounds. That’s actually not a bad return. I hope this new agreement doesn’t change the fantastic price for Business Class on LAN between Madrid and Frankfurt. nor certain other rather interesting LAN pricing on routes where they are not as competitive currently…. All this would disappear if this price fixing er… joint business agreement goes ahead. End of Tesco quarter is 28th January. Will we get the pet insurance points (probably not)? You make me laugh Harry! It does a bit and I bet the dodgiest thing about the place will be the AC! I stayed at the AC in Alicante, and rooms where nice modern rooms. Breakfast was good (very continental). OT: I have a few Marriott points which are going to expire at the end of the month. Does Marriott ever do a bonus buying points promotion? Is it worth buying just 1000 pts to keep the account active then wait for a bonus offer? Or not? They NEVER do bonuses on buying points. Ok thanks – I’ll just the points go! Let the points go even! Virgin Atlantic have previously held a reward flight sale at this time of year. Is anything similar expected this year? (last year Raffles described the sale as the “regular January reward seat sale”). I have been hopeful of something to use my PE upgrade voucher! Did you keep your card until the 2nd year or cancel on the anniversary date when your voucher appeared in your virgin account? And did you get away with not paying the fee again? The voucher appears a little late. However, if you don’t use your card between the anniversary date and the date the voucher appears and you cancel, MBNA refunds the fee. I hope this deal between TAM and BA will not result in equalization of the carrier surcharge for award tickets like with AA. Currently hundreds of pounds for BA and 50 for TAM. It almost certainly will, in the same way that I expect Aer Lingus to add full fuel surcharges, at least when booked via BA, once they are admitted to the US JBA. Stayed in an AC in Madrid – it was very modern, not like a stuffy old Marriott at all. Then again the Marriott I spent most of my time in was Northampton.